TriceraTop Spin is what we are looking at for #Day31 of our countdown. Image courtesy my friend Neal! Hello everyone, and welcome to #Day31 in our #DisneyWorldCountdown! After looks at Soarin’ and Star Tours the past two days, today we are shifting our focus to a ride that is geared more towards your little ones than the thrill seeker in your family. Of course, I’m referring to TriceraTop Spin, located at DinoLand USA in Disney’s Animal Kingdom Park. 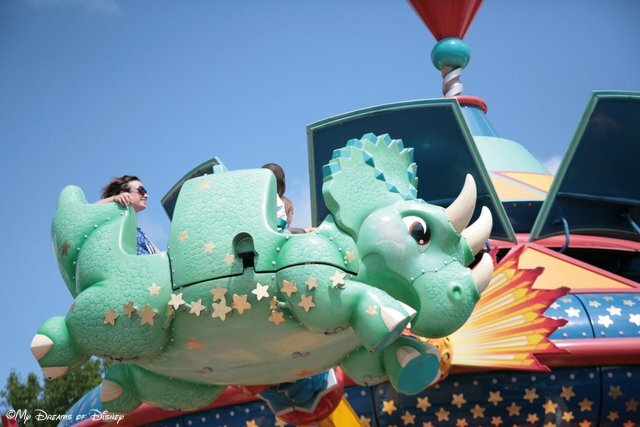 This attraction is similar to Dumbo and the Magic Carpets of Aladdin in that it has a similar ride mechanism, but of course, in TriceraTop Spin, you are riding your favorite dinosaur as you spin around the park! With Sophie being nearly 13, and Riley being 12 and Miss J being 11, I would be extremely surprised if they ride TriceraTop Spin — but I have been wrong before, so who knows! Now, what about all of you? Do you ride it, or have you ridden it in the past, and would you ride it again? Let me know in the comments, and thanks for stopping by! MB Blue – American Adventure Music! Welcome to the first stop aboard Magical Blogorail Blue. Enjoy the ride as we discuss the music at the Disney Parks. 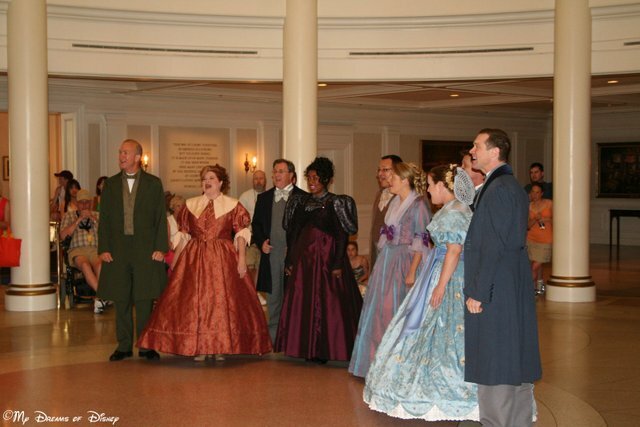 The Voices of Liberty is an Acapella group that plays at the American Adventure. Music. Known to soothe the savage beast, music is a part of our nature, part of our culture. At Walt Disney World, so much of the story is enhanced through the use of music that, in many ways, just hearing a song instantly takes us back to the moment we first experienced it. In today’s post, I’m taking a look at how the music of the American Adventure draws you in, capturing your heart, your mind, and your spirit, and reminds you of how our great country was formed over the years. The beauty of the Voices of Liberty is that they sing incredible Americana songs from days gone by, and they do it with such a charm, grace, and excellence that they are known the world over. We thoroughly enjoy listening to them perform before the American Adventure show begins. 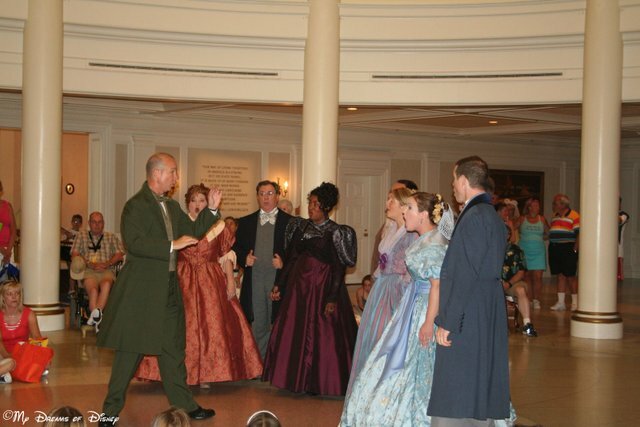 Voices of Liberty, performing before the American Adventure show. After each performance, you are welcome to say hi to the members of the group, and even get your picture taken with one of them, like Sophie did a few years back. One of the members of Voices of Liberty posing with Sophie. The Voices of Liberty are a refreshing change from some of the music that you can here on the radio — I enjoy them so much that I even found an album on iTunes of theirs that I purchased and am listening to in the car! It has such great songs as The Star Spangled Banner, Battle Hymn of the Republic, The Penny / My Country ‘Tis of Thee, and my favorite, Golden Dream. In fact, I like Golden Dream and The Penny / My Country ‘Tis of Thee so much that here are two YouTube videos I found of Voices of Liberty performing those songs. I hope you enjoy them! The music of the American Adventure — in particular, the music of Voices of Liberty — shares so much of what made our country great. My prayer is that our leaders in Washington, from both sides of the isle, would read this, hear the wonderful music, and remember why they got into politics to begin with, and in doing so, work together to bring our country back to what is once was. Thank you for joining me today. 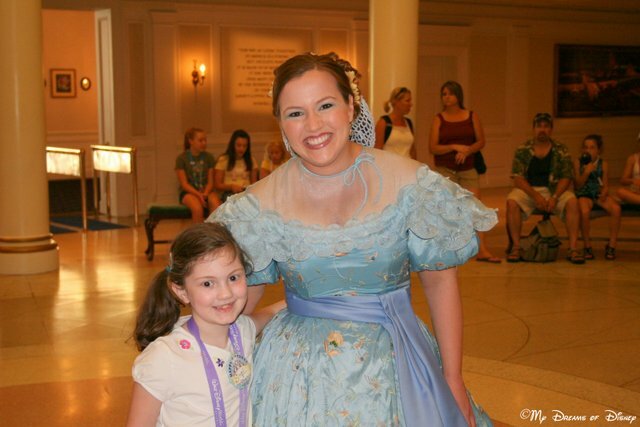 Your next stop on the Magical Blogorail Loop is my great friend Jenn from Disney Babies Blog.